Ever wonder why so many early classic arcade video games were set in space? It wasn’t the result of high-level board meetings at a fledgling Atari analysing reams of detailed research into the things that might excite teenage kids. The reality was much simpler: The <space theme fit the limitations of the hardware available at the time. Filling a screen with colour and detailed graphics, required code. The more code you wrote, the more chips were required to store that code. Then you needed powerful processors to execute that code. Too much code + not enough grunt to make it work = problems. So leaving most of the screen “blank” (which by default would be literally “black”) allowed games to fit into the early fledgling arcade technology of the 70s and 80s. Ridley Scott worked this out too. Go watch the first Alien movie. What scares you is what you don’t see, rather than what you do. You don’t have to spend millions on special effects to get an emotion from the viewer. By contrast, as a life-long gamer, I of course can appreciate the aesthetic beauty of some to today’s home console games. Grand Theft Auto, Fallout, Doom, Spiderman and VR of course, all throw the player into lush worlds constructed by super-talented game designers. You no longer play a Star Wars game, you can now be dropped into the Star Wars Universe. And as a result, we seem to have got to a place where everything is done for the player. The sense of “being there” is delivered in 4K levels of detail. Today, thousands of individual blades of grass can be made to sway in the virtual breeze of a glorious sunset in some lush valley in a fantasy faraway world. And you can run amok right through it. You want to fly down that trench on the Death Star? Sure, go ahead. If you can think it, it can probably be created for you. I watch my kids today grab a controller, switch on their consoles and instantly, with minimal effort on their part, they are literally plugged in. Connected to a life-like world where even an in-game bullet can be tracked to its source by interpreting the source of the sound from their surround sound headphones. 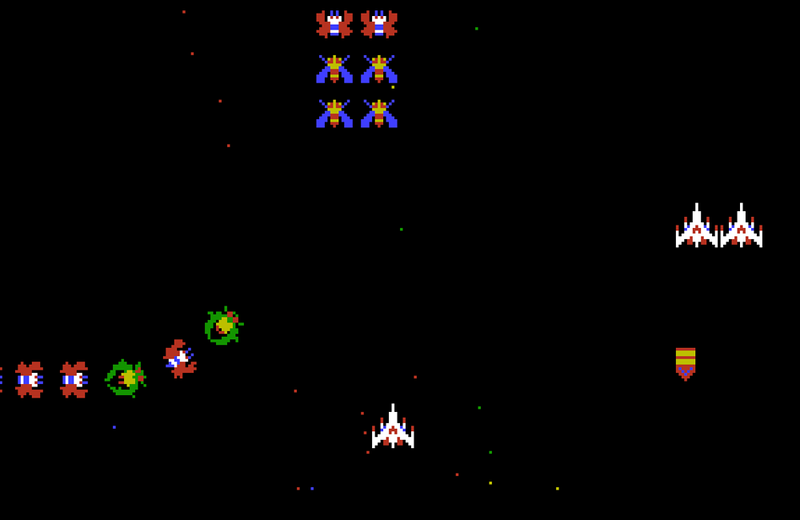 Early arcade games like Atari’s Missile Command were written using around 10KB of code (that’s smaller than the amount of text you’ve just read up to this point laid out in a word document). Those handful of routines could induce the same immersive experience you get today and all for the princely sum of 25 cents. That simple red line falling slowly down the screen against a plain black empty background in Missile Command was an intercontinental ballistic missile, hellbent on destroying a city and tens of thousands of lives on the Californian coast. What Atari couldn’t do back then was wow us with fancy graphics. It was all about the way the game grabbed the player. Atari’s “secret sauce” was easy to learn, difficult to master. Now you might think I’m being cynical about how easy kids have it today when it comes to play. It is true, we’ve come a long way. But there is still a connection if you put the blockbuster games industry to one side for a moment. There’s the small matter of the $60 billion mobile gaming industry. It owes everything to these early arcade games. Flappy bird, Super Meat Boy and Candy Crush, all use that same principle – create addictive games using a tiny amount of code, and get them running on limited hardware. Fear not – the genealogy of those pioneering arcade games are still very much with us. Those practical limits forced upon programmers in the early 80s, affect how video games are written to this day. It’s a salutary lesson for game makers – all the shine and gloss in the world doesn’t make a classic video game, it has to start with the fundamental question – is this fun to play? And the genesis of that question when it comes to video games has been around since the days of Pong. Tony Temple is an arcade game historian, collector, and writer. Read The Arcade Blogger to learn more about his collection and the history of arcade games. Over its 55-year history, Fisher-Price's Little People toy line has provided hours of entertainment, met with controversy, and undergone numerous transformations. Yee-haw! In 1982, Tomy released Pony Plates, a Western-themed variant on its popular Fashion Plates design kit. Children ages 6 and up could create personalized ranch scenes complete with horses, barns, and wilderness landscapes.